The Energy Education Council is sponsoring May as the National Electrical Safety Month to improve their safety awareness regarding working outside close to power lines. The Energy Education Council (EEC) is sponsoring May as the National Electrical Safety Month as a way to try to educate workers about how to improve their safety awareness and work habits when they work outside close to power lines. The 2013 campaign has been entitled “Teach Learn Care TLC” and is being spearheaded by Safe Electric, a division of the EEC. As part of this May’s campaign, Safe Electric has compiled a few, effective safety tips for workers who work near overhead power lines. By being aware of and following these tips, the EEC hopes to reduce workplace injuries caused by electrocutions and, therefore, help improve the safety of U.S. workers. Know where the power lines are – Before climbing ladders, going on rooftops or using long reaching tools, it’s important that workers are aware of the location of power lines. Additionally, they should be aware of the wind and weather conditions that day, as strong winds can make working near power lines particularly risky. Stay more than 10 feet away from power lines – Workers do not have to be in contact with power lines in order to be electrocuted by them, as electricity can “leap” from power lines to objects that are close to them. 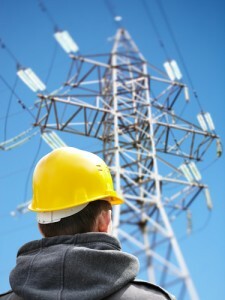 Staying more than 10 feet away will put workers at a safe distance from possible electricity leaps. Always follow proper safety procedures – When it comes to working near power lines, safety procedures are in place for a reason, and cutting corners by not following these procedures can result in severe, permanent injuries. By taking the time to follow the proper safety procedures for working near power lines, workers can minimize the chances of being injured.